A year ago today, we memorialized my uncle, James F. Dowd at Second Presbyterian Church in St. Louis. Jim was born on April 14, 1938 and passed away on November 21, 2016. It had been a tough stretch for the Dowd clan. My father, Jim's oldest brother, died on August 4, 2016. Two major leave-takings in a single year. I wrote a post about my Dad soon after he passed away. Jim was a very important person to me and when my Aunt Betty asked me to speak at his service, I agreed immediately. I found the task a sobering prospect, and a tremendous honor. I followed my cousin Ken Dowd, who did a wonderful job memorializing his father. When I spoke I managed to get through delivering my remarks without coming unglued, but it was close. I have the honor of speaking this morning, it seems to me, for two reasons: one, as a representative of the wider Dowd clan, and two, as someone who knew Jim as kin and collaborator. I am indebted to Betty for the opportunity. I will do my best to be brief, but I make no guarantees. James Fullerton Dowd was the youngest of three sons born to David and Martha Dowd, who lived in a steep-roofed Tudor home on Oxford Avenue in Massillon, Ohio. The family had settled there from Cleveland, because David Sr. thought the bustling steel town a promising spot to launch his fledgling legal practice–in 1929, mere months before the crash. Jim and his brothers David Jr. and Jack–the former my father, the latter my uncle–slept on the third floor of that house in a converted attic, a knotty-pine-paneled masculine enclave, with a lucky horseshoe over the door. Dave and Jack each in turn attended the College of Wooster and Michigan Law School. But Jim charted an alternate path, concluding quite sensibly that the family was already adequately stocked with lawyers. He shipped out for parts east, first to Cornell and then Yale Divinity School, entering the pastorate. Of these three powerhouse brothers, it may be said that they were uniformly accomplished, ambitious, committed to service each in his own way, and prototypically rock-ribbed, as people once said of Republicans. Here again, Jim innovated. Had the manifestly capable J. F. Dowd made a different set of choices, he might very well have generated substantial wealth in a corporate or legal marketplace, or secured fame in the political sphere. But Jim was called to a life which traded in a different currency, and which defined capital otherwise. His preaching was devoted to this alternate vision of value, a radical embrace of the reign of Christ here on earth, as opposed to an apocalyptic future, or some smoky Great Beyond. He argued and acted for justice and mercy, here and now. I was lucky to work with him on a book of his sermons, aptly titled In Pursuit of God’s Kingdom, which captures–and note, I am speaking in the present tense–which captures his depth, rigor and subtlety as a writer. He was the best preacher I ever heard, and especially in this pulpit I’ve heard very good ones. More intimately: let me tell you about my Uncle Jim, who blessed my wedding, baptized one of our kids, and gave me a place to stay once when I was at sixes and sevens, well-nigh frantic about my prospects. He and Betty had our back, and likewise were there for my sister Cindy in the clutch as well. He counseled our boys at sensitive moments, too. 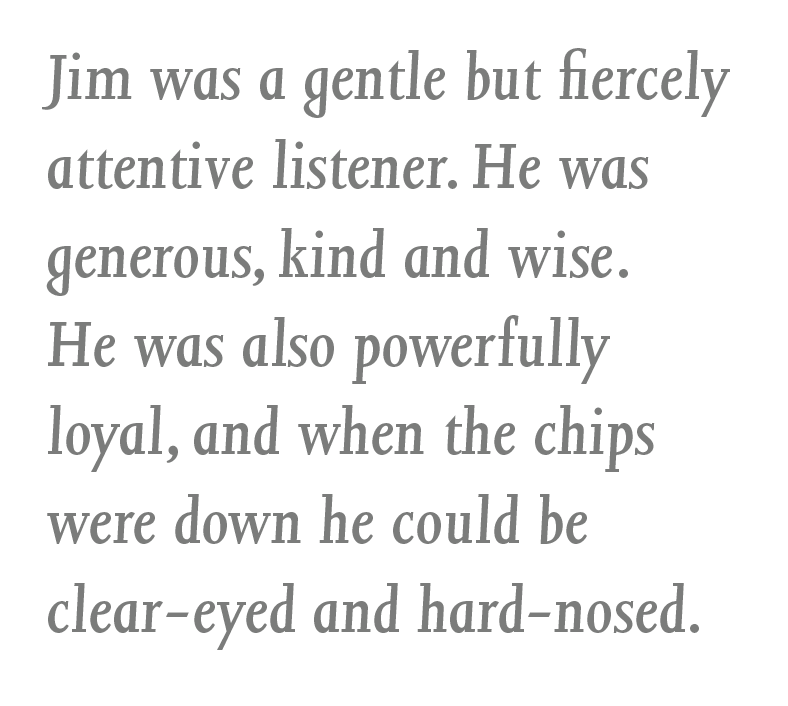 Little of this may be news to many of you, but for the record: Jim was a gentle but fiercely attentive listener. He was generous, kind and wise. He was also powerfully loyal, and when the chips were down he could be clear-eyed and hard-nosed. He was patient, except when he was not. He may have mistreated a golf club once or twice in his life. What’s more he savored music and literature, Jazz and Updike in particular. Devoted to the church, he was a deeply humane man, and saw not the slightest conflict between the two. When Jim stepped away from the Church of the Covenant in Cleveland, his last parish, he and Betty retired to their alternating semiannual retreats in St. Louis and the house on Dewey Lake near Dowagiac, Michigan. The arrangement made it possible to see plenty of Deb and Jeff, and Matt and Amy, and Ken and Jennifer, as well as the grandchildren. But I benefited, too. During the winter months, Jim and I met for lunch every so often at Dressels' in the West End. Where we were safe to sneak a little fried food, beyond the supervision of our wives. My name, and those of my wife and sons. “I needed to write that down,” he explained, “just in case I forgot.” It was his way of saying, “This is happening to me,” acknowledging the disease that would bedevil his last years, and eventually take him from us. It was a modest, well-crafted gesture, designed to deliver the news efficiently. We talked about his unfolding experience. Even in the face of a biological cruelty, Jim was reflective, and ever-decent. Gratefully, gratefully, let us note that his essential kindness never left him—a final gift part his, and part God’s. Jack passed away in 2004, and David in August of this year. Jim, the youngest, went last. We console ourselves that the Dowd boys are back romping around on Oxford Avenue, playing sandlot football, comparing notes, and scuffing up the knotty pine paneling above, in that old Upper Room. We offer thanks for lives well-lived, and for James Fullerton Dowd. Amen. There is one last thought I want to express about my uncle, which wasn't quite appropriate for the moment. When he entered the pastorate, around the time I was born, mainline American Protestantism was still dominant. Those pastors were highly respected as learned (almost exclusively) men. During Jim's career, many changes came to the pastorate. The Civil Rights movement and Feminism came first, calling into question the old order, including that of the church. Gay rights and the emergence of the LGBT movement followed, discomfiting many more of the old guard. Susan Ellsworth, page design, D.B. Dowd, illustration, In Pursuit of God's Kingdom. Jim got all of those changes right. He became a freedom rider and heard MLK speak, even as a young pastor in a small rural post. He championed women pastors and preached on feminism; he advocated within the denomination and in his own churches to welcome the witness and full participation, including ordination, of gay and lesbian folks. He initiated major interfaith partnership groups. He preached against the Iraq War. Generally speaking, the hours got longer, the stress went up, and the professional prestige of the pastorate declined. Some might have resented those changes and started to mail it in. Jim did the opposite, leading with others to create a more vital church for a new time. Broadly speaking, in the Age of Trump much of American Protestantism has gone in the tank. The mainline churches still have work to do. We could use a great many more Jim Dowds these days! Happily, his preaching and the lives he touched survive him. Amen indeed! Jim and Betty Dowd in 2014, at Second Presbyterian Church, St. Louis. Photograph by Keltner. I am looking for better photographs of Jim and Betty, and will add same when I am able to. The house at 1021 Oxford NE, Massillon, Ohio, where Jim Dowd spent his childhood. David D. Dowd, Jr., John C. "Jack" Dowd, and James F. Dowd. Family snapshot taken by David D. Dowd, Sr. or Martha Combrink Dowd, late 1940s. Shady Shores Resort, Dowagiac, Michigan. Photo courtesy of Deb Clinebell (née Dowd, daughter to Jim and Betty). Tinted Photograph Postcard, Shady Shores Resort, Dowagiac, Michigan, circa 1940. The Dowd family began vacationing here in 1938. My Uncle Jim and Aunty Betty Dowd continued this uninterrupted tradition with their own children, which continues to the present day. D.B. Dowd and Heather Corcoran, Cover Design, In Pursuit of God's Kingdom, Ulcer City Publications, 2011. I was privileged to work on this project, a compilation of Jim's sermons. The cover design is a quotation from the stained glass wall behind the chancel at First Presbyterian Church in Urbana, Illinois. Susan Ellsworth, page design, D.B. Dowd, illustration, In Pursuit of God's Kingdom. Each of Jim's sermons got a launch like this one, with all-cap Joanna type and a two color image. This sermon, one from a series on the Lord's Prayer draws on my Aunt Betty's prodigious and skillful weaving to make its point. D.B. Dowd, Angel, spot illustration for In Pursuit of God's Kingdom. I drew this image of damaged statuary at Bellefontaine Cemetery in St. Louis, the city's 19th century Protestant necropolis. I now associate the drawing with Jim.